An Armored Personnel Carrier, Really? Not a fan of the #occupy movement. Yesterday at #OccupyPhilly, they decided to block the Market Street Bridge. While most of them dispersed when the cops started getting out the handcuffs, about 24 of them decided to lock arms and continue blocking traffic. This made me wonder whether you get a 24 for 1 taser deal when you taser one of a group of 24 hippies locking arms. I don’t know, but if the experiment was tried, I’d like to know the results. 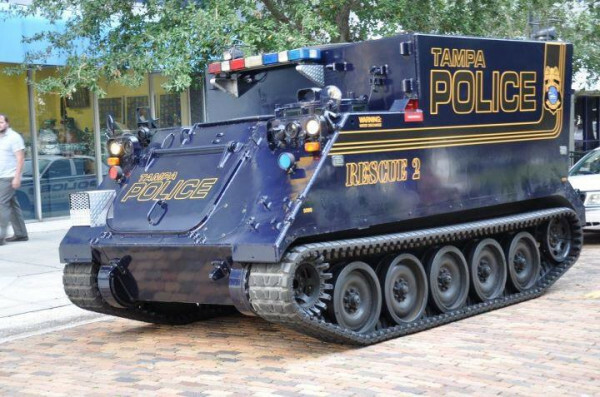 Regardless, back to the title of this post, it would seem that the Tampa police decided they’d drag out the Armored Personnel Carrier to break up the Occupy folks. Really? We need to bring out military equipment to clear out a bunch of hippies camping in a park? Wrestle the Deer? Or Taser It? We keep militarizing police departments. Police departments now serve the main mission of protecting the elected officials who hire them. I’d like to see, in PA, county wide departments headed by the elected sheriff with 1st, 2nd, and 3rd class cities retaining their own departments with an elected police commissioner who has authority over the PD. It’s getting out of hand when 4 man police departments are using swat teams and full auto rifles to serve misdemeanor warrants. Yep, I can confirm that, but not how you might think, lol. I was a police officer once (there’s a reason our city’s PD has a high turn-over rate, but I digress). When I went through the academy, we did this when they were demonstrating Tazers. Who are they gonna rescue with an M113? Waste of @#$^* taxpayer money. Typical police over-reaction. Unfortunately this type of response from the police is becoming the norm. I’d like to think that police would begin to question their orders. I’m not holding my breath. This is a great video I found on Youtube regarding mindless obedience. This should be required viewing at all police and military academies. They could have an M109 Self-Propelled Howitzer like mighty Sheriff Lobo Joe has. Kevin, the ’09 is pretty light, with no armor to speak of, as I recall. And admit it … if you could afford one, you’d have one, right?! Never can tell, might be some would-be assassin hiding among them. Not that it would ever happen. It’s over reaction like this that will make the Occupy groups get sympathy! When you turn out Military like equipment to go after spoiled kids, you are wrong headed and idiotic! The mere fact that the Tampa police have one of these is absurd. I’ll bet they have been waiting for MONTHS for the opportunity to take that sucker for a spin. Now if it were equipped with a Ma Deuce taser then it might be appropriate…. I am gonna go out on a limb here and say is a remnant from the 2003 FTA Meeting in Miami. The Feds dropped a boatload of cash for security because they were expecting the Seattle Anarchists and every spare LEO form middle Florida and down went to Miami. Police presence was impressive and the control of crowds was even more impressive. Everybody who was not a troublemaker was treated with the utmost courtesy and the bad boys were pounced to a pulp. I spent that day home watching the “festivities” and I have to admit I had fun. They had undercovers infiltrated among the anarchists and anyone who reeked of leader or “initiator” was targeted and secured. There was this one guy with a slingshot sending bolts and this 5 foot tall Hippie chick came from behind, produced an ASP baton and crossed the guy on his legs 5 ways from Sunday; she was a cop. Yes, Sebastian, we do. It’s called ‘rehearsal’. When it’s not called ‘desensitizing’. I lived in The Bronx (NYC) during the height of the crack epidemic, and all the police stuff we’re complaining now were being tried out and refined then. It was OK, doncha know, because it was poor non-white people with no political clout whose rights were being violated, so nobody said anything. Those few that did were dismissed out of hand, and here we are. None of the comments I’ve read above has noted that those dirty smelly hippies are Americans (just like we are), and your basic premise, Sebastian, is that using an M113 is too much, and that “public safety” (or sanitation or whatever) being used to crush our Right to Petition Our Government short of deploying armored vehicles is just peachy. Today it’s people we feel safe laughing at. Tomorrow it can (and eventually will) be us. And God Forbid that anyone mention that this kind of aggression justifies shooting back. Don’t want to scare the white people, after all. Yes, because our right to petition involves jumping in the roads and blocking traffic, right? Surely it’s just an overreaction to these peaceful protesters, which is why they break up Tea Parties with similar military equipment. Maybe they were hoping to grease their treads with patchouli? They’ve got it, they need to use it to justify keeping it. They’ve likely got a whole specialized team in their maintenance div. devoted to taking care of it as it sits in the garage gathering dust. When the bean counters come through looking for ways to cut the budget, the PD needs to be able to claim they’ve used it in X number of crowd control/riot/shooter actions so they can justify keeping their toy. Instead of plain water cannons, they need to have ones that shoot soap. The hippies will scatter like roaches. While I normally agree with pretty much what everyone else has said as I write this, it occurs to me that when you have a violent riot IF you have one you’d probably want to put your (lightly) armored AFV in harm’s way instead of the normal light skinned stuff. Take that bolt spewing slingshooter: he could break windows and/or require body shop repair. With this M577 he’s at most scratch the paintwork. That was the lasts episode of that show I watched. Made me sick to my stomach! I totally would have volunteered to drive that thing through a hippie tent-city down there. Just sayin’. heh. It’d be like Eric Cartman driving that giant drill (the “hippie digger”) in the Die Hippie, Die episode. haha. On a side note, Cartman did have it right – could have saved a lot of effort and money, instead of using an APC – just bring in a loudspeaker and blast some death metal music… the hippies would flee like cockroaches in the light. When all you have is a tank… everything looks like a chinese dissident. Indeed; for a recent American example of this principle, look at how the FBI solved the messy problem of religious dissidents at Waco. M577 Command Post Vehicle. Lightly armored, not unlikely at all that many of your readers have a rifle that could penetrate it. It’s tall to fit several work stations with radios and/or computers inside. A lot more stable in an emergency or disaster than a wheeled vehicle. I notice that they’ve replaced the stock GI metal tracks with rubber track pads with street friendly rubber tracks. Not sure how well those work.